Jacknella ran a successful print and mail audit for CBM, showing substantial savings. 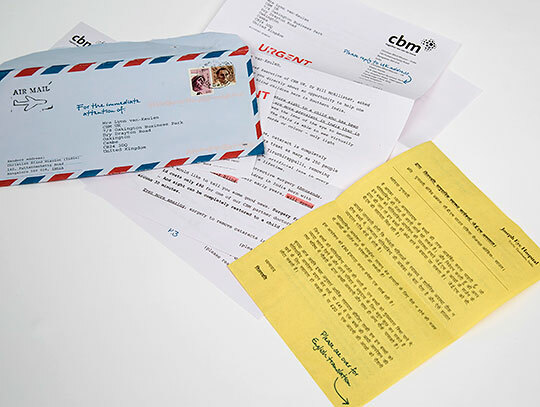 We managed their direct mail programme successfully for several years. At Jacknella we have original ideas to deliver the very best in acquisition campaigns – the lifeblood of any charity. CBM is an international Christian disability and development organisation, committed to improving the quality of life of persons with disabilities and at risk of disabilities in the poorest countries of the world. CBM's vision is an inclusive world in which all persons with disabilities enjoy their human rights and achieve their full potential. Support projects that promote prevention of disabilities. Provide treatment for those with disabilities to improve quality of life and overcome the barriers which cause exclusion. Address poverty as a cause and a consequence of disability. Acquisition is more of a marathon than a sprint… but you've got to keep at it!